Each week to celebrate the brighter side of school life we send a text to all staff and parents to let them know what happened during the week. Below are some of the weekly texts we've been sending out. Cluny news! Well done to our TY enterprise companies in DLR County Finals, ‘Replace Your Lace’ got 2nd and special merits for ‘Mobile Makeup’ and ‘Restraw’! Our Blue Angels treated 6th Yrs to a surprise pizza lunch! In Cluny we do COMPASSION – our thoughts & prayers are especially with all in Cookstown, Co Tyrone and Christchurch, New Zealand today. In Cluny we do Seachtain na Gaeilge le céilí agus scileanna GAA! 3rd Yr History visit Glasnevin. TYs at Fightingwords Workshop. 5th & 6th Yrs at Spanish film & tapas. Ag Science trip to hear Prof T Boland, UCD. 3rd Yrs at Quinn School Quiz in UCD. Jr & Minor basketball qtr-final wins! Badminton - 3rd place in finals! Past pupils visit to share college experience with students. Cluny Assembly supports ‘Save the Planet’! Sports Update! Following Louise and Laura’s amazing hockey goals in our Minor 1’s Leinster final win, Louise now has over 18K views and has been entered into Goal of the Month on several hockey sites – well done ladies, you’ve all done us proud! Amazing week in Cluny! Hockey Minor 1’s are Leinster champs! Badminton U16’s in Dublin finals! Katie M sings for Dept of Foreign Affairs & TY German students have Q&A with German & Hungarian Ambassadors. Senior History trip to Derry. Engineering Week for all! TYs feature at Junk Kouture at the Helix. Pancakes all done before Ash Wednesday. Big Cluny welcome to 1st Yrs 2019 on Wed evening. In Cluny we do JOY! Super Cluny Friday! 3 TYs meet Minister of Education at Euro Money Quiz. Prof Brendan Kelly talks to 5th and 6th Yrs re psychiatric effects on soldiers during World War I in Cluny Library.. 3rd Yrs at Romeo & Juliet. 5th Yrs visit UCD. TYs attend French Theatre Workshop. 1st Yrs at Women’s World Day of Prayer. Fiji House lunch. Basketball wins for Junior A’s & Minor A’s against Loreto Dalkey. Huge congrats to staff & students for our amazing Open Evening! In Cluny we do Happiness! Great things ahead for Cluny! 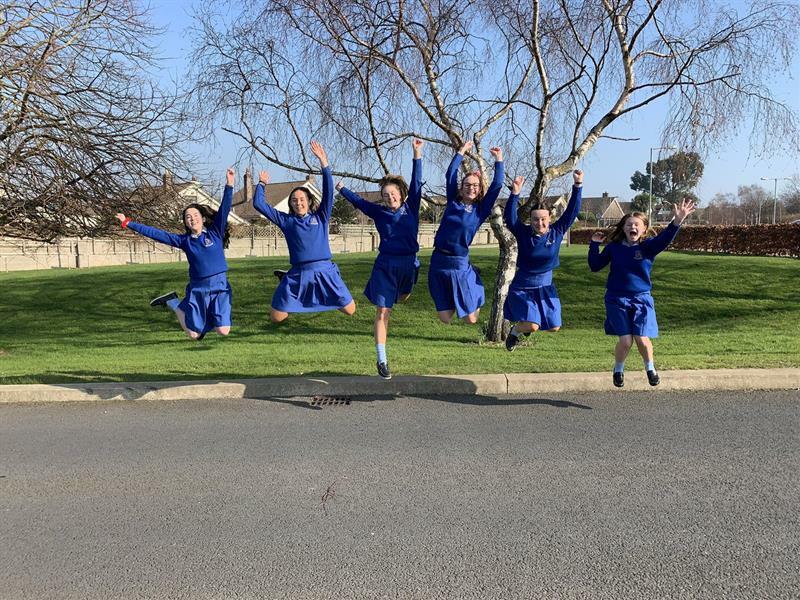 Best of luck to our 2nd Yr debaters in TCD on Saturday; to our school Choir in Wesley Choral Competition this afternoon; to our hockey Minor A’s in their Leinster Final next week and our badminton U14’s who are through to their Leinster Finals. In Cluny we definitely do Happiness! Positive Friday! Congrats to badminton U14’s – 1 final & 2 semis to come! Well done Leah & Lily at Le Chéile Conference in Athlone. 5th Yr Concern debaters reach national playoffs & are invited to Concern HQ to speak. TYs on work experience. 5th Yrs on campus tour to TCD this week. 1st Yr Science help EPA & An Taisce initiate European Air Pollution Research Project. Good luck to Mocks students! Good News Friday! Well done Kara in Leinster debates. Badminton U16 Div 2 Dublin League winners! Hockey Minor 1’s into semi-finals! Basketball wins v Beaufort & HCK. 15 TYs at BOI Global Markets Event. CPR training for all TYs & all at GoQuest today! Creative writing workshop for 5th Yrs with Dermot Bolger in Cluny Library. House Quiz for all. Good luck 2nd Yr debaters tomorrow in TCD. Fab Friday! Aer Lingus pilot Lisa gives student talk in Cluny Library. 3rd & 6th Yrs at NCH recital. 5th & 6th Yr Physics visit NUI Maynooth. 1st Yr anti-bullying Sticks&Stones workshop. House meetings underway. 5th Yr Gael Linn debates. Congrats to Kara C on qualifying for qtr finals - English OCTO debating. New GAA jerseys arrived. More badminton success for U16 A’s v Wesley & U19’s, 3rd in Leinster finals. Cluny Wins & News! Quinn Business School UCD awards 6 TY Business pupils for outstanding JC results. Badminton U19 Senior Div 2 winners! Wins for hockey & basketball. JC Gaeilge orals finished. Internet Safety talks for all students. TY hold court in mock trial in Criminal Courts of Justice! Past pupils give Engineering talk to TYs. A big Cluny welcome to 2019 First Yrs for fun afternoon.